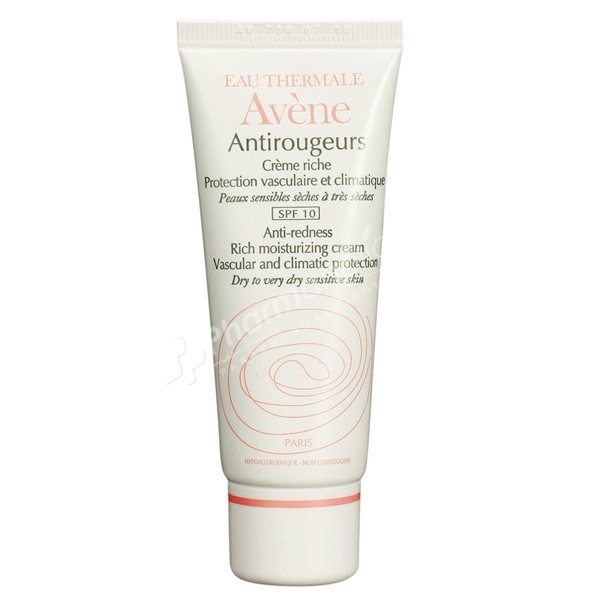 Avene Anti-Redness Rich Moisturizing Cream is creamy and nourishing and suits dry to very dry skin perfectly. It regulates cutaneous microcirculation and protects fragile skins from climatic aggressions, which make them particularly sensitive. Through it's creamy and moisturizing texture, the skin is left soft, soothed and full of comfort. It prevents and reduces diffuse redness in sensitive skin and brief flushes become less frequent. The skin's complexion is once again clear and even. Contains an SPF 10. In the case of visible small vessels, use in conjunction with Avene Diroseal. Hypoallergenic, non-comedogenic (does not aggravate acne, or clog pores) and has good skin tolerance due to its high Avène Thermal Spring Water content, and its minimal, carefully selected ingredients. Apply in the morning and/or at night to a face that has been thoroughly cleansed with Avène Extremely Gentle Cleanser.